I’m not a HUGE fan of the music of Iron & Wine, essentially the stage name of singer-songwriter Sam Beam. I liked his early lo-fi recordings, with his breathy, almost whispering vocal delivery, there was nothing at all like it coming out at the time, but his music seems to have become more polished and produced along the same trajectory as his rising fame, something I don’t, personally, consider a good thing. HOWEVER, while browsing Vimeo, I stumbled on a video for a song off of the new Iron & Wine album, Ghost on Ghost, and it really caught my eye, which, to state the obvious, qualifies it for this installment of my Eyecatchers series. So, the music I can take or leave. It’s kind of a sweat, quiet song, somewhat reminiscent of early Sam Beam, but nothing particularly special. If I can thank Mr. Beam for one thing, however, it would be for introducing me to the work of animator Haley Morris. You know you’ve been hooked, when watching one video leads to watching another, and another, until, as if in a blink of an eye, your lunch break is over. 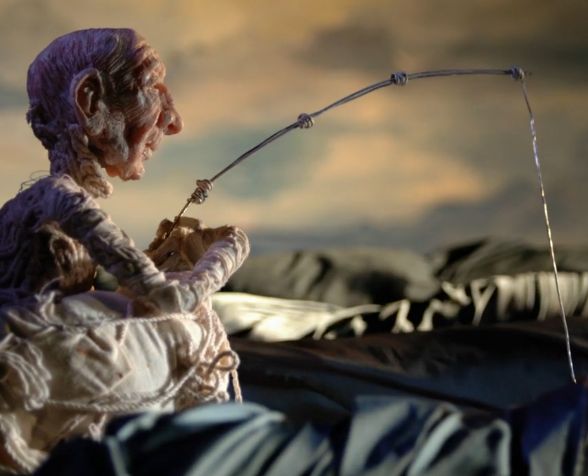 Morris’ stop motion animation is absolutely stunning, with a dreamy quality that can transport you into her world of imagination. The mind boggles at the time and care it must take to craft these images and set them in motion, one frame at a time. I hope you enjoy the following as much as I did: the Iron & Wine video, a behind-the-scenes look at the making of that video, and then one of her other shorts, titled Undone. reminds me of living in San Francisco and going to the animation festival every year. This is pretty amazing.